ST. IGNATIUS – The Flathead Indian Irrigation Project began implementing water shut offs last week and conditions are only expected to get worse in the coming months, according to a report issued by Bureau of Indian Affairs Project Manager Pete Plant. Water shutoffs were implemented July 2 for users who utilize water from Pablo Reservoir, which serves around 38,000 assessed acres. The reservoir is approaching critical dry levels, Plant said in the report. Irrigation is shut off for 5-10 days, so the Flathead pumps could send water for storage in the reservoir. 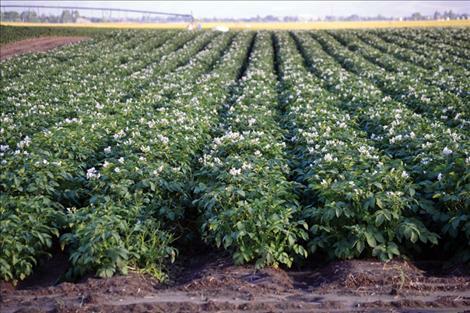 Future shutoffs could be imminent depending on conditions. Flathead Joint Board of Control irrigation Commissioner Shane Orien said the impacts of the shut-offs are significant and could harm the farming community. “We all are shut off right now,” he said of his Polson neighbors. Without water, there is little farmers can do to preserve their crops. Orien said irrigators were ill-informed about exactly when the shut-off was going to take place. Orien said irrigators hope the shut off will be short-lived, but even a 10-day hiatus could come with serious consequences. Orien said he is unhappy because enforcement of water rotation has been inequitable amongst his neighbors and that a third pump that pulls water from the Flathead River into Pablo Reservoir laid unfixed until recently. All other parts of the irrigation project are being impacted by the drought to some degree. In the typically dry Camas region, a .70 acre feet quota set early in the season is expected to be met. Storage is at 77 percent of capacity and 127 percent of average. In the Jocko Valley, storage is at 43 percent capacity and 78 percent of average, with 5,015 acre-feet usable. A .5 acre-feet quota has been set in the Jocko Valley to ensure equitable distribution. In Mission Valley, rainfall for April through June was at 30 percent of normal and recorded precipitation at alpine snow sites was 25 percent of average. Current storage by the project in the valley is at 48 percent of capacity and 49 percent of average. Project operators plan to deal with the water shortage by implementing a ration or rotation schedule for the entire Mission Valley for the remainder of the season. Operators will enforce the .75 acre feet quota established at the beginning of the season. - Work cooperatively with neighbors and the Irrigation System Operator to assist in implementing any water scheduling including a ration and/or rotation schedule. In order to effectively manage their service area, Irrigation System Operators need your cooperation. - Call in all water delivery orders including ons, offs, and changes. - Correct all water losses and inefficiencies.